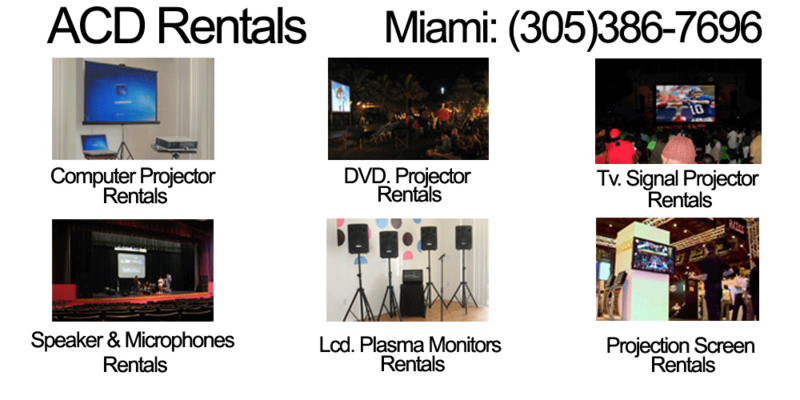 We rent LCD or Plasma monitors from 34″ to 60″ with floor or table stands. You can use them with your DVD, disc, or computer. No need to worry about cords or connections. Our technician will do a professional set up. We can connect to your cable box and project any …. A big monitor is ideal for displaying photos, videos or commercials in your booth at a trade show, where there is no space for a projector or a projection screen, an additional advantage since a monitor offers a higher resolution than most ordinary projectors. Save on your computer all the information you want displayed at your business or family meeting, and then display it in one of our giant monitors of up to 60″. We can mount the monitor on a floor adjustable height stand, this way the monitor will be at the height of the eyes of the attendees or even higher. That DVD where you recorded videos and photos of the family can be displayed in a large high-resolution monitor for your guests to appreciate even the smallest of details. We will deliver the monitor to your home or location of the meeting and we will do the entire installation.